Nina: Nana my birthday is coming up. Have you planned a surprise party for me? Nana: Well if you are expecting one, you’ll be surprised to find out I haven’t. Hyuk hyuk. Nina: Oh Nana. How could you be such a crumudgeon? 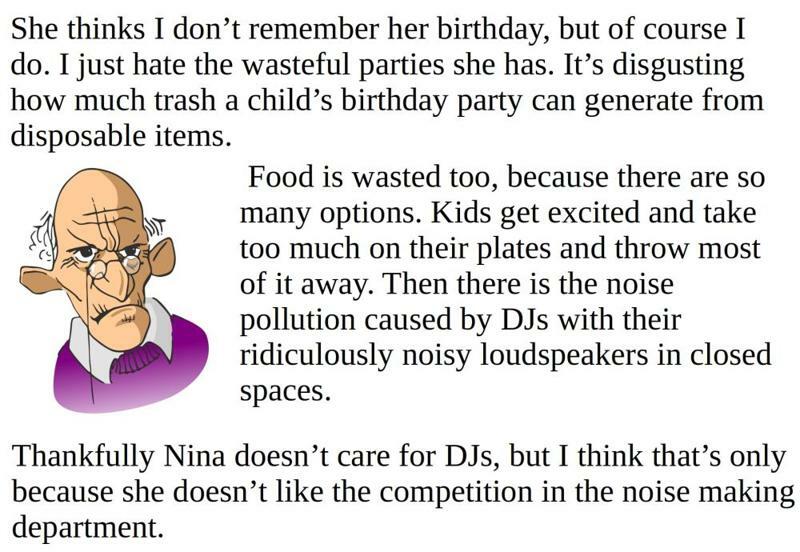 Nana: Well, birthday parties are terrible for the environment you supposedly care so much about. They generate so much waste just for a few hours of entertainment. 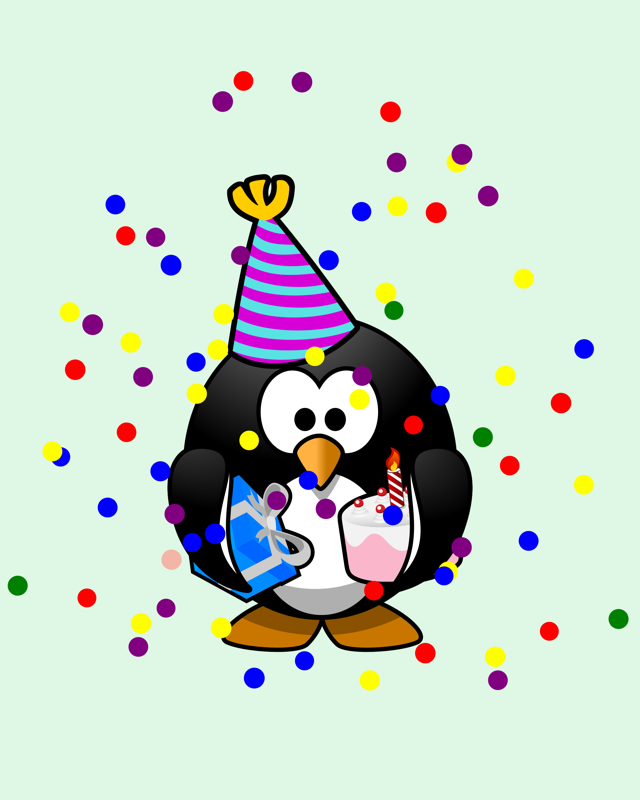 Confetti, balloons, paper plates, plastic cups, pizza boxes, cola bottles, party decorations, gift wrapping paper, paper napkins the list just goes on. Nina: Oh Nana! What a time to choose to care for the environment. You never have, and now suddenly, just because I want a party, you do. Nana: Well it is easy to care about something when it doesn’t inconvenience you. Besides, I have always cared about the environment. I have never made a big show of it, but my generation produced far less waste than yours does. Nowadays everything is disposable. Do you know this rocking chair I use, belonged to my grandmother. In those days things were made to last. Now they are made cheap and shoddy and then disposed without a thought for the waste of resources and the harm to the environment. Nina: Nana you are right indeed. I don’t want to be a hypocrite. So let’s plan a green party together. I’ll invite only my closest friends, we’ll make some vegetable sandwiches, cake and serve freshly squeezed orange juice. Don’t worry Nana. We can separate the wet and dry trash so the vegetable and fruit peels can be used for composting. We’ll also use steel plates and glasses. Nana: Now that’s more like it. But who is going to wash all the utensils? Nina: We’ll do that too. We’ll set is an assembly line where one of us soaks the plates, and passes it to another who puts soap and the next one scrubs them and the next one rinses them and the last one dries them with a towel and then we all switch positions by one. We’ll make a game of it with some music like musical chairs. Nana: And what about return gifts? Nina: Nana will you help me sort through our attic and find junk I can either use or sell. I read that there is a lot of money in discarded items and trash. There are gangs that have turf wars to increase their domain of control in landfills so they can make more money. Surely our attic has something we or someone else can reuse. Nana: Fine! Me and my big mouth. I should have just bought you pizzas. Nina and Nana start sorting through the dusty items in the attic and Nina finds a wooden box. Nina: What is this Nana? Nana: Oh my. I can’t believe I completely forgot about this. Your grandma used to crochet beautiful coasters and cushion covers. But after your mother became a toddler, she would spill and drop food and liquids and some of them got ruined. We put them away safely and planned to use them again once you mom became older. But by then machine made coasters and cushion covers became so cheaply and easily available, we forgot about these. Nana’s eyes glistened with tears and his voice choked up. Nina patted him on his shoulder. Nina: Nana I have a great idea. Let’s give these as party return gifts. I bet my friends have never seen anything so intricate and beautiful. I am sure the idea would have made Nani happy too. Won’t it be nice to have a new generation appreciate her work? Nana: Yes that sounds okay. Fine you can have your party. And now I know what gift I am going to give you. Nana: Oh this one is going to be a real surprise. Nina: Wow Nana, did Nani actually make this gorgeous dress? Nana: Yes. She made it for your mother on her birthday. I hope you don’t mind getting something used? Nina: Are you kidding? It’s the most beautiful dress I have ever seen, and it fits well with our party theme. #NinaAndNana: The three Rs. Reduce, reuse and recycle. Nana: Okay, now if you want this party, go away and give me a few hours of peace and quiet. I need it to survive a couple of hours with a house full of brats. This series is created in collaboration with Lavanya Srinivasan. Here is the link to Lavanya's #NinaAndNana posts.